Please refer to our stock # SOR6903 when inquiring. A mid Edo period (16th to 17th century) five plate cuirass (go-mai-do) of heavy iron emblazoned on front with a sun and moon in inlayed silver over the fierce god Fudomyo with protective sanskjrit characters in silver damascene on the sides and a five character phrase (The Gotoku or five precepts of Confucianism, also espoused in the book of five rings) on back, also in silver. It is lacquered red inside, and about the waste hang rows of black lacquered scales laced in blue with color fleckedwhite mimi-ito. The lacquer is in rough condition. The Sode are made of plate iron lacquered black within, also laced in blue with white mimi-ito. The Sode are signed Koshu-nushi Myochin-Ki Nobunawa and dated an auspicious day in the 8th month of Tensho 2 (1574). 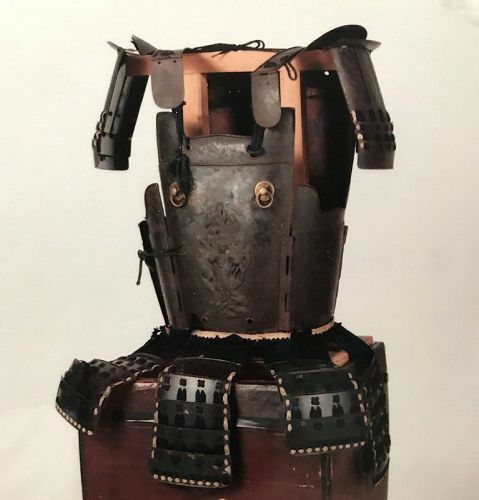 Perhaps these were heirlooms passed down through the family that were incorporated into a suit of armor in the mid Edo period. It comes with papers from the Japanese Armor Society. A jizai butterfly with the same signature is held in the Musuem 50 in Kaohsiung Taiwan. The Takahimo and Aibiki Himo (the tie chords connecting the front and back of the do on the right side and at the shoulder) are weak and need restoring, and one of the plates covering the Kohaze on the right shoulder (front) has been replaced. I am offering it in original condition to allow the collector the right to choose the level of restoration desired.